The biggest surprise of round 5 was guest Shottaz's (#2) easy road victory over Outlaws (#4) 89-65 on Thursday evening. It ended at the same time the two-game winning streak of Outlaws. Defending champion maintains second place with 5-3 record behind leader Raiders. Outlaws at the other side dropped to the third position with four games lost. Fourth ranked Outlaws (4-4) saved a 3-point victory on the road edging 3rd placed Hoyas (3-4) 61-58 in the game for the third place. Outlaws moved-up to third place. Hoyas at the other side dropped to the fourth position with four games lost. A very close game took place in between Outlaws and Spartans. Fourth ranked Outlaws (4-4) got a very close victory on the road over bottom-ranked Spartans (0-7). Outlaws managed to escape with a 3-point win 77-74 on Saturday evening. Outlaws moved-up to third place. Loser Spartans still closes the standings with seven games lost. Leader Raiders faced 3rd placed Hoyas. Host Raiders (6-0) defeated guests from (3-4) 64-56. Undefeated Raiders have an impressive series of five victories in a row. They maintain first place with 6-0 record. Hoyas at the other side dropped to the fourth position with four games lost. Bottom-ranked Spartans (0-7) tried to put together a comeback for its first victory of the season, but they fell short in the 77-57 loss to second ranked Shottaz (5-3) in on Sunday evening. But it was rather predictable considering how strong their opponent was. 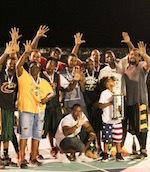 Defending champion maintains second place with 5-3 record behind leader Raiders. Spartans lost their seventh game in a row. They still close the standings with seven games lost. Leader Raiders faced 3rd placed Hoyas. Host Raiders (6-0) defeated guests from (3-4) 64-56. Raiders have an impressive series of five victories in a row. They maintain first place with 6-0 record. Hoyas at the other side dropped to the fourth position with four games lost.